For this month's "Maps Of The Month" featurette, I wish to draw your attention to TerraEsperZ's Castlevania: Bloodlines maps. As Hallowe'en draws near, it's fitting to revisit some video games that feature ghouls and ghosts and goblins. And here's one game whose honour here as Maps Of The Month is long overdue: Castlevania: Bloodlines (or Castlevania: The New Generation for those of you in Europe), as mapped by TerraEsperZ. The only Castlevania game on the Sega Genesis is set in 1917, and sees John Morris and Eric LeCarde on a quest to stop Countess Elizabeth Bartley from reviving Count Dracula (again). As ancestors of the Belmonts, Morris and LeCarde have the skills necessary to take down all the baddies that threaten WWI-era Europe. And thanks to TerraEsperZ, we have the maps to help them out! The stages are few, but they are long and varied. From Romania to England, every pixel of every leg of the journey is here. Check out the bizarreness of the Leaning Tower Of Pisa! And the Munitions Factory in Germany provides the requisite climb up giant gears. This game may not be as well-loved as other games in the series, but it's still classic Castlevania. So to recognize the effort put into mapping a Castlevania game (and who doesn't love Castlevania? 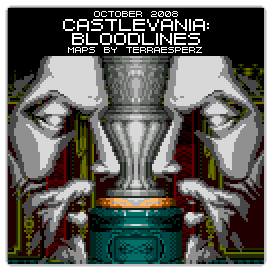 ), TerraEsperZ's Castlevania: Bloodlines maps will be known as VGMaps.com's Maps Of The Month for October 2008. For this month's "Maps Of The Month" featurette, I wish to draw your attention to rocktyt's Metroid: Zero Mission (GBA) maps. Twenty-one years ago this month (or twenty-two if you live in Japan), gamers were introduced to the original Metroid game on the NES. In one of the first "retraversal" adventure games, bounty hunter Samus Aran ventures deep into Planet Zebes to stop the Space Pirates' misuse of Metroids. After destroying the Mother Brain and escaping an explosion, Samus removes the Varia Suit. The ending is hardly a spoiler to anyone now, but this reveals that Samus is a woman, more surprising in a time when video game heroines were uncommon. More recently, Samus's original mission was revamped for the Game Boy Advance as Metroid: Zero Mission. While it's mostly a retelling of the same story, Zero Mission has better graphics, new items, more bosses, as well as a continuation of what happens after Samus removes her suit, allowing her to demonstrate her stealth skills and touching upon her origins as a defender of the Chozo. rocktyt has recently mapped out the reimagined Zebes, including the new area, Chozodia. It's nothing short of amazing to see every detail of each area of Zebes all at once. Great job, rocktyt! And zerofighter, too. Be sure to check out their Metroid: Fusion maps, which are equally impressive! 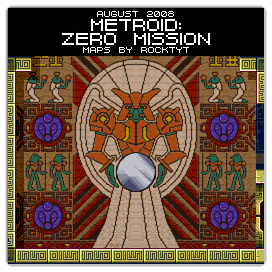 So to recognize the effort put into mapping the definitive version of Samus's original adventure, rocktyt's Metroid: Zero Mission maps will be known as VGMaps.com's Maps Of The Month for August 2008. For this month's "Maps Of The Month" featurette, I wish to draw your attention to DarkWolf's Wolfenstein 3-D (PC) maps. It's World War II, and you are B.J. Blazkowicz, "the Allies' bad boy of espionage and terminal action seeker". In six episodes, you will fight through German castles and take down Nazi forces, including a version of Adolf Hitler in mechanized armour! Though historically inaccurate, this game should at least be in the history books of video games, by being one of the first first-person shooters. Certainly the first really popular FPS to really start up the genre, at least. 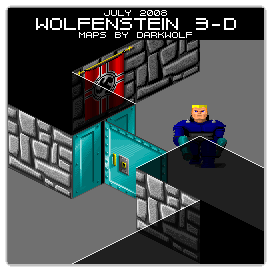 So to recognize the effort put into applying new techniques to a timeless classic, DarkWolf's Wolfenstein 3-D maps will be known as VGMaps.com's Maps Of The Month for July 2008. For this month's "Maps Of The Month" featurette, I wish to draw your attention to RT-55J's Contra III: The Alien Wars (Super NES) maps. There's not a whole lot to say about this game's story. It's the year 2636. Aliens attack Earth. You're a macho guy, and you have a macho friend, and both of you have some big guns. 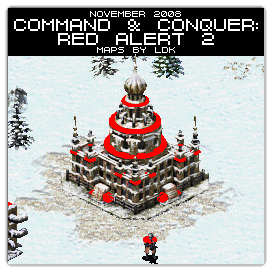 Run-and-gun gameplay ensues. Like any other Contra game, you'll have a blast just running ahead, blowing up every alien unfortunate enough to cross your path. 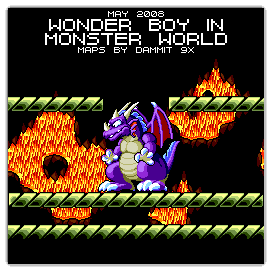 You probably won't truly need RT-55J's maps - but they're fun to look at, especially if you want to relive this classic when you're nowhere near your Super NES (or Wii). The many big bosses, the incredible detail, even a stable look at Stage 2's and Stage 5's rotating Mode 7 maps. For any oldschool fan, what's not to love? 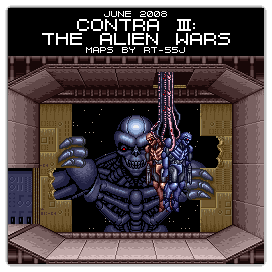 So to recognize the effort put into this Super NES classic, RT-55J's Contra III: The Alien Wars maps will be known as VGMaps.com's Maps Of The Month for June 2008. 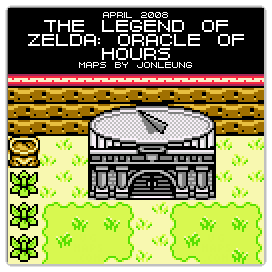 So to recognize the effort put into finishing off the "Triforce Trilogy", JonLeung's The Legend Of Zelda: Oracle Of Hours maps will be known as VGMaps.com's Maps Of The Month for April FOOLS' 2008. 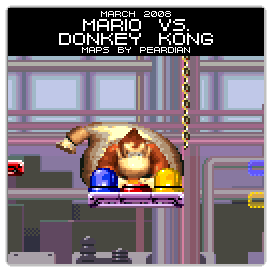 For this month's "Maps Of The Month" featurette, I wish to draw your attention to Peardian's Mario Vs. Donkey Kong (GBA) maps. It comes as no surprise that there would eventually be a game named as such - Mario Vs. Donkey Kong on the GBA is a relatively recent adventure that pits, well, Mario against Donkey Kong. Looking to reclaim toys stolen from the big ape, Mario (now apparently in the toy business) must make his way through more than a hundred puzzlicious rooms! Expanding upon the platforming puzzle elements first seen in the Super Game Boy release of Donkey Kong in 1994, the game is an incredible challenge to work through! Cue my standard line about needing maps: well, you'll need all the help you can get, and Peardian (resident Mario mapper and multi-Mapmaker of the Month) at least provides these. Timing your jumps in Expert Stage x-8? You're on your own there! 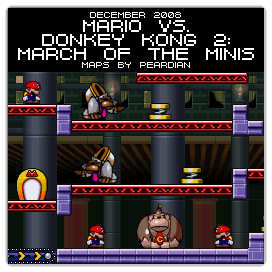 So to recognize the effort put into making these maps from a modern classic, Peardian's Mario Vs. Donkey Kong maps will be known as VGMaps.com's Maps Of The Month for March 2008. For this month's "Maps Of The Month" featurette, I wish to draw your attention to Captain Drake's Zoda's Revenge: StarTropics II (NES) maps. With the worst of winter upon us, wouldn't it be nice to break away to a tropical paradise? Yeah, that'd be nice, wouldn't it? But the sequel to StarTropics isn't as much of an island-hopping adventure, but a time-traveling journey! Well, whatever gets you out of the snow. ...Except that the first stop is an icy mountain in the past. So much for that idea. 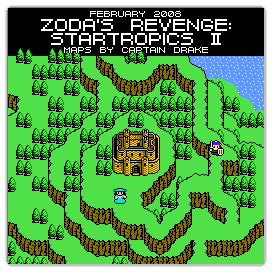 So to recognize the effort put into making these maps from an underappreciated game, Captain Drake's Zoda's Revenge: StarTropics II maps will be known as VGMaps.com's Maps Of The Month for February 2008. For this month's "Maps Of The Month" featurette, I wish to draw your attention to Will Mallia's Ninja Gaiden Trilogy (Super NES) maps. It's another year, but for many of us, maybe it doesn't feel any different. We still go through the same motions we did last time around. The same could be said about Ninja Gaiden Trilogy, the upgraded/repackaged trio of Ryu Hayabusa's adventures, as we first saw on the NES. Now they're all on the same cartridge, with upgraded 16-bit graphics and a new password save system! The flying enemies still hit you when you're trying to make critical jumps, and the Jaquio's not any easier to defeat! But at least the adventures are the same, intact with those nifty cut-scenes, and revisiting them is certainly not a bad thing. The stage layouts are identical to the original NES games, but both are exemplary examples of oldschool platforming action for either generation. Will Mallia has mapped all of the Super NES trilogy and most of the NES trilogy - truly, few people can survive three ninja adventures (or even these games) - and Will Mallia braved them twice! 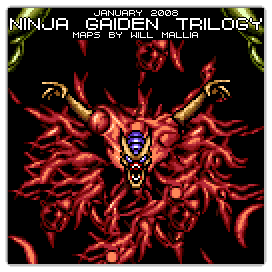 So to recognize the effort put into making these "ninjatastic" maps, Will Mallia's Ninja Gaiden Trilogy maps will be known as VGMaps.com's Maps Of The Month for January 2008. 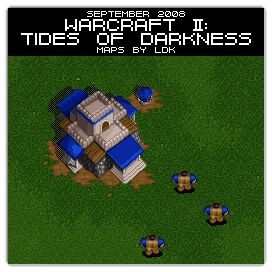 Congratulations and thanks to the Mapmakers of 2008!